app design for ios, android and desktop. “change the way you love your music”… ceft and company new york’s engagement with norwegian tech firm, vidflow, included the identity design for the company as well as the development of the company’s product: an app optimized for ios and android devices, as well as a fully-scalable desktop website that allows users to stream official, hi-def music videos on demand. the app, which is available for free, also offers a premium version that will be ad-free. the digital app will be launched in europe first and later brought to the US. vidflow already streams over 80,000 videos and has the backing of universal music group (which consists of, motown records, virgin records, defjam recordings, republic records, capital records, island records, geffen records, A&M records, interscope records) as well as warner music group (which consists of atlantic records group, warner bros. records group, rhino entertainment, parlophone label group, warner music nashville, warner classics) and sony music entertainment (which consists of columbia records, epic records, RCA records, sony music nashville, sony masterworks, provident music group, legacy recording, red distribution, sony music worldwide, ioda, orchard labels). 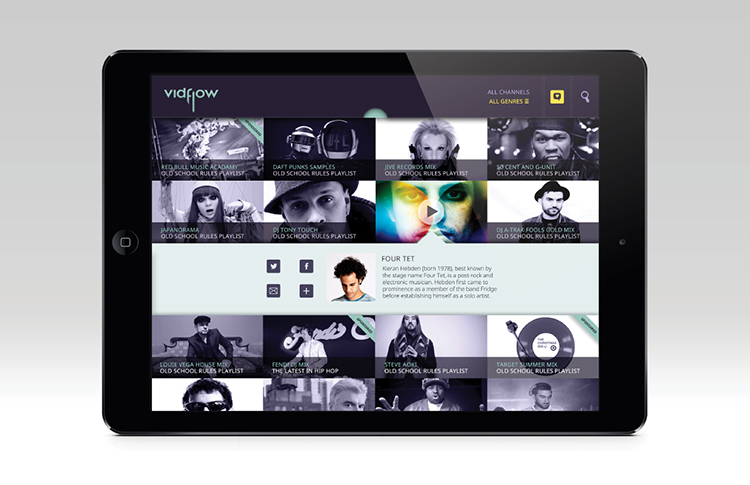 the vidflow user experience can be seen in the above animated video. 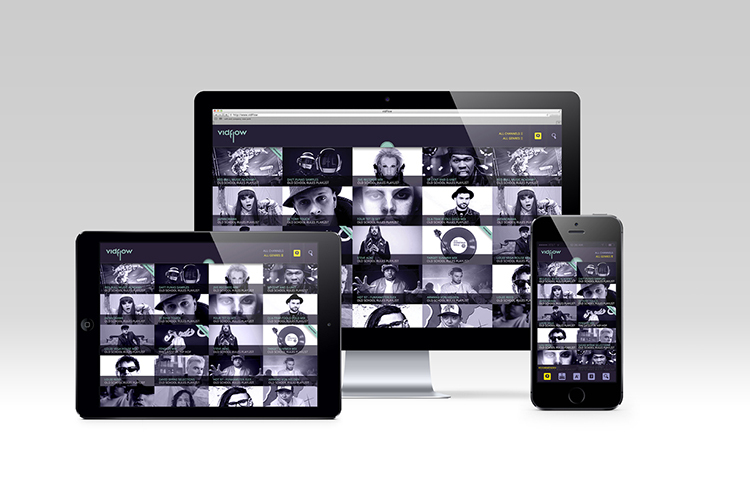 ceft and company was commissioned to develop the ui and ux of this ground breaking app, allowing users to seamlessly browse and watch an extended library of music videos. 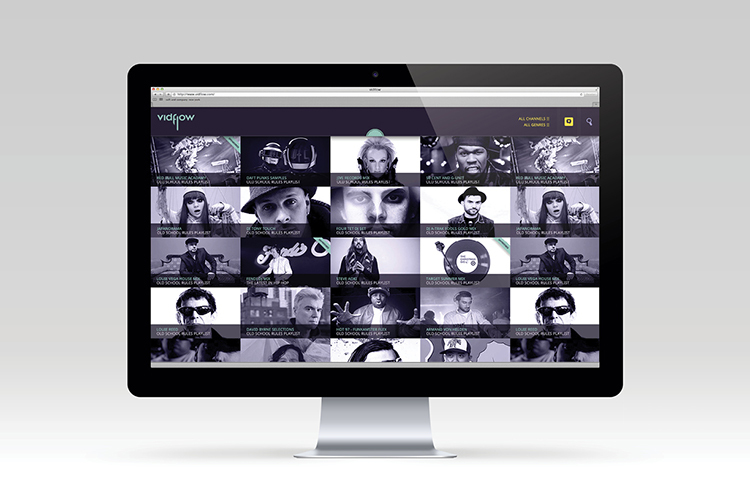 the music videos are assembled together in playlists that are put together by a variety of artists, vj’s, dj’s and personalities within the music industry. 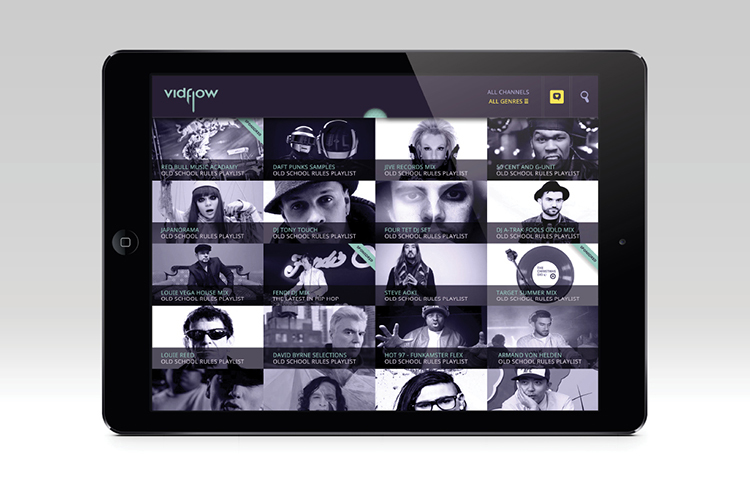 users can also view playlists by artists or genres or simply search the library. the app was optimized to work on all digital platform including ipad, iphone, android devices, and all current desktop browsers. 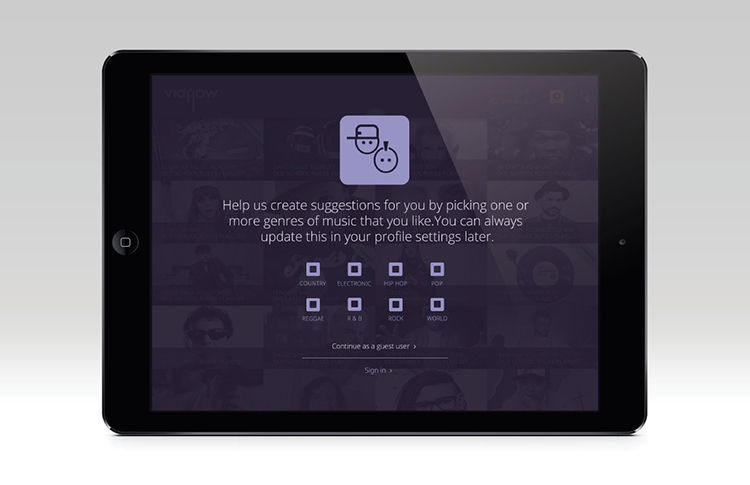 upon entering the app, users are prompted to select the genres they prefer to help the app produce relevant suggestions. the landing page beautifully and uniformly displays playlists that are most appropriate for users. the app’s algorithm learns about the user the more time the user spends with the app. upon selecting a play list the vj, dj, or guest personality info will be displayed, along with the type of videos included in each playlist. beautiful and simple full screen display of the videos with full social media functions and device controls elegantly organized on one screen. user library to select and store favorite playlists. 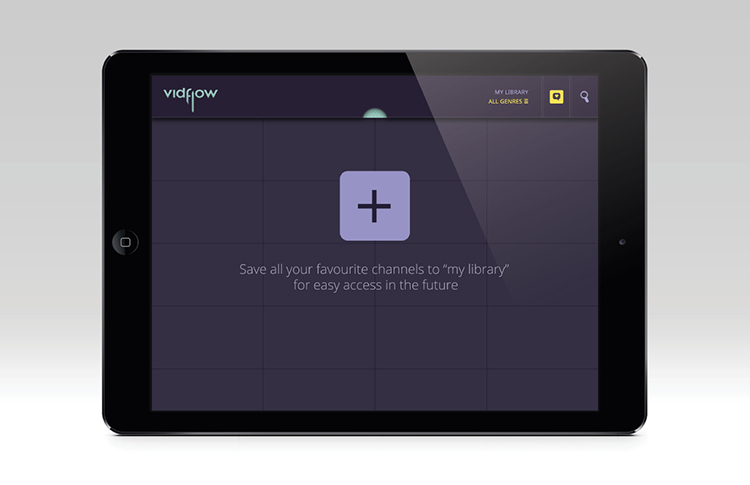 vidflow’s settings panel offers social media sharing preferences, as well as video quality and premium subscription. the app elegantly sizes down to mobile devices such as iphone and android, with full functionality neatly tucked away in a simple user interface. 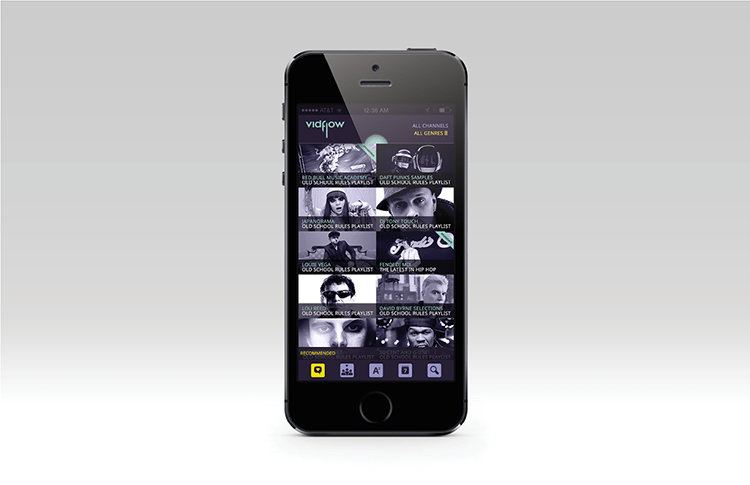 featuring full screen video on mobile devices such as iphone and android. website: the desktop version sizes according to the users display, in a full responsive manner. 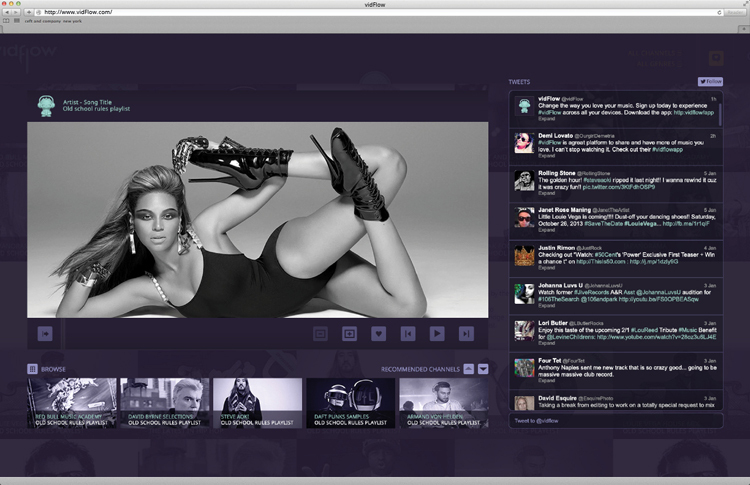 the desktop version includes an intermediate page that can be customized to pull in an assigned twitter feed, allowing users to interact, read and share opinions. the intermediate page can be customized by a sponsor, in this case supreme, and the twitter feed can then be switched to pull in the sponsors’ feed or a requested hashtag. above: the intermediate page as it will appear when customized for fendi. the app was designed with an intuitive user experience as a key objective, without ever losing sight of the opportunities that allow the company to monetize in a manner that best serves not just the advertisers, but also the users. view all work related to this project.